I took this shot about two weeks ago on a particularly hot day. Hot enough that this woman took her two little dogs into the fountain to cool off. Nice shot, I can understand her, and even more the dogs. Lovely post for the end of summer. Beautiful picture. I love day life shots! Great bench in the deep! And why not, that's what taxes are for. Is this across from Long Wharf? Truly a beautiful and funny photos! She has 'gone to the dogs' in the best possible way. The way you capture her makes her so endearing. Someone we would like to know. Great shot. Kids must love it on a hot day as well. How cute! My grandson would love to do that! Great photo. Do tell, where is this fountain located? Did you receive the email that I sent to you asking about a certain fountain with waterjets that criss-cross that was featured as an aerial photo on the msnbc photos of the week? I'm thinking it was the fountain at the Christian Science Center. Some days I wish I was one of those "lucky dogs"!!! I'm sure the designer of this water feature had this in mind for its use! lol! Thank you all for your comments. 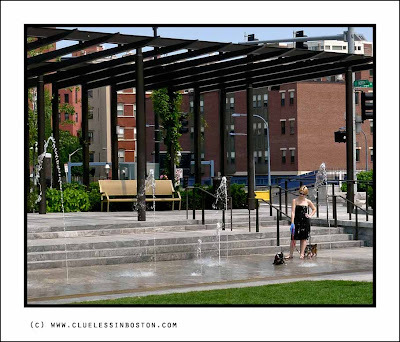 This is one of the fountains on the reclaimed land that used to be the elevated Southeast Expressway and was named in honor Rose Kennedy as The Rose Kennedy Greenway. John, yes this is near Long Wharf. Harriet, no I didn't get your email, but I looked up the picture on MSNBC and it is indeed the fountain at the Christian Science Center. Sure beats trying to wash them in the kitchen sink!